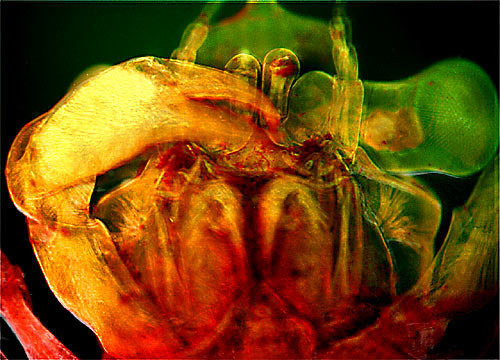 Upon reaching the second larval stage — known as the megalops stage — the young crab has developed a body more closely resembling that of an adult, having evolved little claws and other legs similar to its progenitors. Even so, the immature crab has not yet curled and tucked under its large abdomen and thus appears to exhibit a tail, looking very much like a miniature lobster or crayfish. During this time of its life, the young crustacean continues to grow and is able to swim and crawl along the water's bottom. Eventually, after further molting, the megalops emerges into the first crab stage, looking like a small version of its adult parent.